A Nosode is a Homeopathic "Immunization" as opposed to a "Vaccine." For more information on homeopathy, please see What is Homeopathy and How Can Our Animals Benefit from Homeopathic Remedies and Nosodes (PDF). Please Note: Homeopathic Remedies and Nosodes are not returnable due to FDA regulations. The EPM Nosode is available in pellet form or as an oral spray. Pellets come in a 1 or 2 dram bottle. The oral spray comes in a 1 oz (small) or 2 oz (large) bottle. A 1 dram bottle of pellets will treat 3 animals for approximately 1 year. Nosodes are for prevention, but they can also help to heal a horse who comes down with EPM. I have personally used this Nosode to cure one of my horses of this insidious dis-order. She could not walk, could not coordinate her steps and her face, both cheeks had atrophied and she was having trouble chewing when the vet diagnosed it! 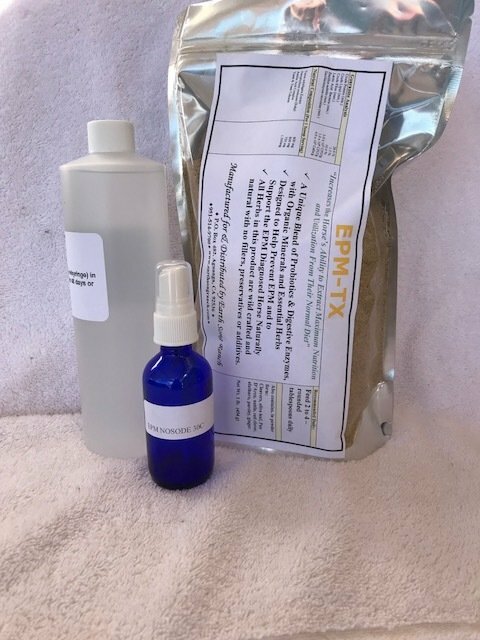 For EPM Positive horses, the EPM Homeopathic Kit is a protocol developed by holistic veterinarian Gerald Wessner, DVM. The Kit contains the EPM Nosodes and a Liquid Homeopathic. This homeopathic kit has been used on 2,500 horses around the country and will heal the horse over a course of 48-60 days. "Both of my horses came down with EPM in the summer of 2017, one was in training the other at home, we do not know how they came in contact with this, but I found the Earth Song Ranch website and sent for two EPM kits immediately, each of the horses showed signs of improvement very quickly, the one at home it seemed to take longer so we put that one on the EPM Herbal TX and he is now being ridden, at a walk, and seems to be doing better each day. Every fall I will make sure my horses are on the EPM Herbal TX to prevent this happening to them again, and I have also put them on the EPM Nosode to also prevent this horrible disease."